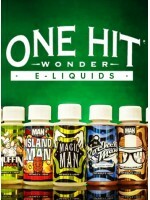 One Hit Wonder - Island Man ICED 100mLLegend has it, the Island Man rose straight out..
One Hit Wonder - Fire Man 100mLFireman by One Hit Wonder is a tantalizing freshly pressed Pink ..
One Hit Wonder - Army Man 100mLKey Lime Pie80/20 VG/PG Ratio100% made in the USAMade with TruNic 2.0..
One Hit Wonder - Muffin Man 100mLA Unique Blend of Sweet Apples and Warm Cinnamon Muffin. The Muffin..
One Hit Wonder - Rocket Man 100mLBalancing a lightly tart Greek yogurt, fresh mountain blueberries &..
One Hit Wonder - Magic Man 100mLBalancing a trifecta of fruit flavors and blending them into a sweet..
One Hit Wonder - Mini Muffin Man 100mLThe best strawberry muffin on the planet, shrunk down to a min..
One Hit Wonder - The Man 100mLA delectable blend of strawberry fruit and milk cream. The M..
One Hit Wonder - Island Man 100mLLegend has it, the Island Man rose straight out of a..
One Hit Wonder - My Man 100mLVanilla, Strawberry, Chocolate. Today, the rich flavors we all love hav..